This one’s for our British friends: The promoters of the Gary Numan-headlined Back To The Phuture concerts taking place this April in the U.K. are offering up a pair of free tickets to the London event — also featuring John Foxx and a DJ set by Daniel Miller — for one lucky Slicing Up Eyeballs reader. 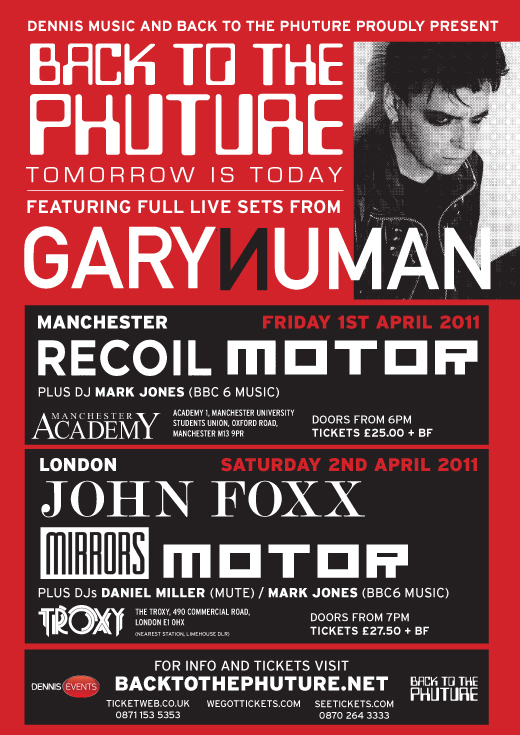 The April 2 show at London’s Troxy will feature sets by Numan, Foxx, Miller, the bands Motor and Mirrors, and DJ Mark Jones (an April 1 gig at the Manchester Academy features Numan, Motor and Recoil, aka former Depeche Mode member Alan Wilder). To enter, just leave a comment, any comment, really, at the bottom of this post by Friday, March 11 — and use a legit e-mail address, of course, because that’s how the winner ultimately will be contacted. One winner will be drawn at random sometime after that point, and will be given two guest-list spots for the London gig. You can also win tickets to either show via the Back To The Phuture Remix Competition, which lets fans remix Numan’s “Scanner” or Foxx’s “Shatterproof” (details here). Or, if you’re inclined to just buy tickets to the gigs, you can do that right here. Congrats on the second year of Slicing Up Eyeballs! Your Web site is awesome! Just found your site 3 weeks ago. Without a doubt the more informative website dedicated to this music era on the entire internet. Thanks for keep me/us all in the loop on news, tours, re-releases, etc. Eek! <3 That show is on my birthday. Great to see these guys still doing it on the road, Foxx still unashamedly analogue too. Thanks for continuing to cover my ‘frank’ years. What you on man, to get those eyes! Move over,chumps…….the tickets are mine !!!! My favorite website – bar none !!! Here in my car, I feel safest of all, I can lock all my doors except to go see Gary Numan in London!!!!!! Sounds like a great show to me! Cheers! Down In The Park AND Underpass? Heaven…..
Would kill to see him do some old Tubeway Army stuff. i’m leaving a comment, any comment. I’ll hop across the pond to be there. Long live Numan, Foxx and Slicing Up Eyeballs! I’m in, ready to go !!! my last day in the uk for a while so would be nice to say goodbye to british isles with Numan and Foxx! Yay! I feel like a Numan!